By just looking at a bottle of wine, you are given hints as to what wine is inside. The bottle’s shape, colour and label can help you identify the style of wine. Varietals, regions and styles can have distinguishable bottles types. There are approximately 8 to 12 predominant bottles and a few other quirky ones. Here are a few of the most common bottles and how to identify them. From the name, we know that this bottle was traditionally used for the wines of Bordeaux, France. It is common for bottling wines in many regions, both old and new world. 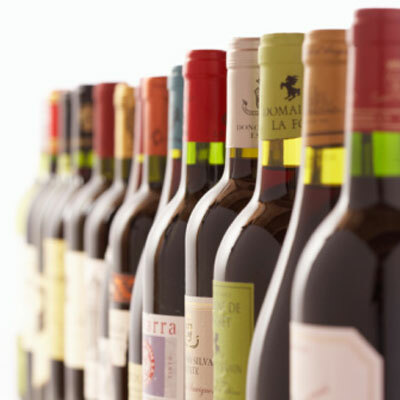 Many different types and styles of wine are found in Bordeaux bottles. From traditional Bordeaux varieties of Cabernet Sauvignon, Merlot, Malbec and Semillon, to Chianti and sweet wines. The broad shoulders of the bottle help to stop the sediment of tannic or aged wines, from ending up in your glass. Most commonly you will find Riesling in these bottles. They are noted by a tall and thin neck with very narrow shoulders. Wines from Mosel and Alsace are traditionally in green glass, while Rhine is in brown glass bottles. Wines in these bottles will range from dry to sweet, so it is important to read the label carefully. Champagne’s bottle is built for practicle reasons. The pressure of the contents inside requires that the bottle be made of thick glass, with a deep punt (indentation on the bottom of the bottle). Cava, Prosecco and Sparkling wine are also bottled in the Champagne-style bottles. Most noteably, you will find a foiled cork and cage, which helps to contain the contents. Both these regions have similar shaped bottles. This is a popular format for many wines, and you will commonly find Syrah, Grenache, Chardonnay and Pinot Noir in these bottles from Australia to Washington. The defining character is their gently sloping shoulders and wide base. Wines from Rhône, mainly Châteauneuf du Pape, will also have a coat of arms on the neck, above the label. Port, Madeir and Sherry are all types of fortified wine. The most common and consistent bottling is the Port bottles, with the bulge in the neck. The bulge is meant to catch sediment as the wine is being decanted prior to serving. These bottles are not regulated in many regions and are not required by governing bodies. New world producers will typically follow European traditions, but are not held to any bottling rules and regulations. These most common types of bottles will give you an idea of the wine inside. What can you see in your glass?